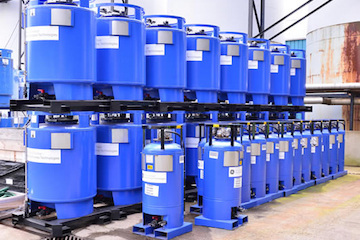 Francis Ward is one of the only companies in the UK to have the knowledge, experience and skill to be able to manufacture containers approved by the UN for the transportation of the extremely hazardous materials associated with the nuclear industry. For example, using our knowledge of making drums for hazardous liquids, we were able to develop the ‘Annu-drum’ a container specifically designed to transport a mixture of fissile materials and acids, with very specific geometrics, to minimise the risk of a runaway nuclear reaction! In addition to our ability to design bespoke products, we also have a range specifically created for dangerous goods which includes our PCM, HG and APL ranges. To view our range of IBCs for hazardous applications please click the link below.